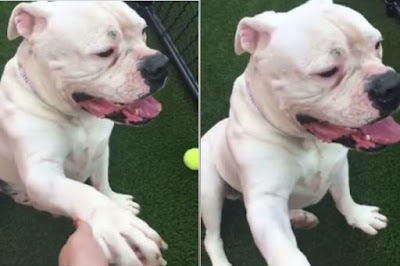 This Baby Has Out Of Time Soon, Sweetest Bulldog Boy Needs A Serious Adopter Or Rescue Asap! Adorable mushy sweet lovebug COCO A1776523 knows how to sit and give paw ❤️ We cannot understand how this precious boy has been dumped at the shelter twice through no fault of his own. Despite what he's been through, he's such a loving and sweet soul who just wants to love and be loved. He would do best as the only pup in the home so he can have you all to himself 😍 Please help save Coco! The only hope he has is us. SpeakUp, a kill shelter is no place for a dog like COCO, to spend the days of his life. Let’s use our voice, and the power of this community to find him the forever family he rightfully deserves. If you or someone you know is interested in giving this precious pup the home he deserves, please contact the Miami-Dade Animal Services at (305) 884-1101 and reference the shelter ID #A1776523. 1 Response to "This Baby Has Out Of Time Soon, Sweetest Bulldog Boy Needs A Serious Adopter Or Rescue Asap!" Angels, please save this wonderful pup.